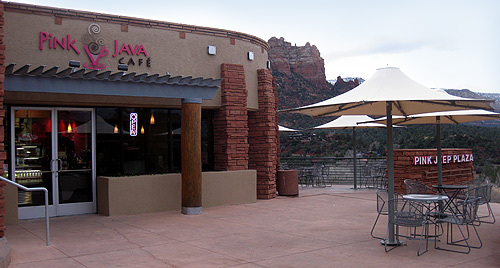 I received an email from Dylan Jung, a barista in Sedona, AZ. He wrote in to let us know about a new coffee shop owned by Pink Jeep Tours. A view of their pink La Marzocco. Look at that fantastic patio! The photos I took are outside and inside with Manager Bob McLain. 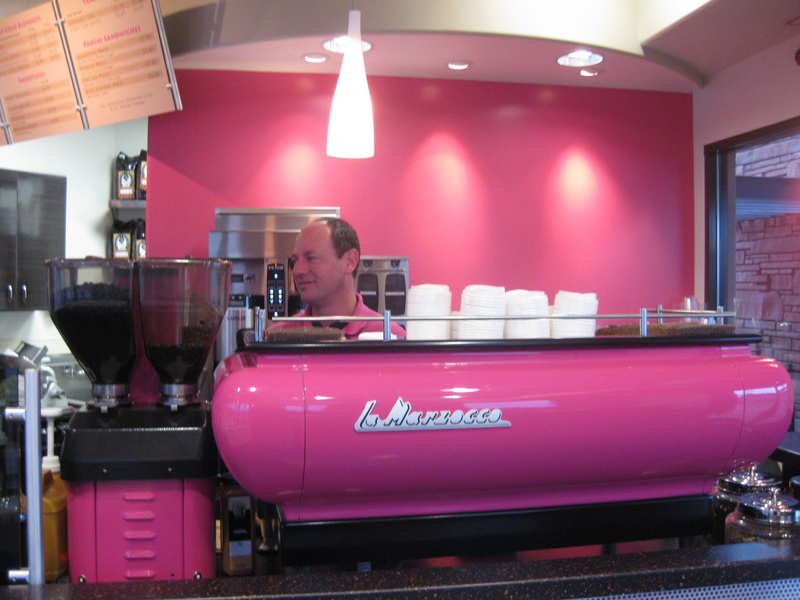 They just opened in the last 6 months but I thought I would share photos I like to call “It’s pink!” I figured everyone would really get a kick out of the pink La Marzocco. They are owned by Pink Jeep tours so obviously they figured it would be a good idea to have a cafe people could hang out in while they are waiting for their tour. They are using Ritual Roasters out of Carlsbad CA. Nice to see they are using good coffee, it’s a shame you have to reach so far for the good stuff! 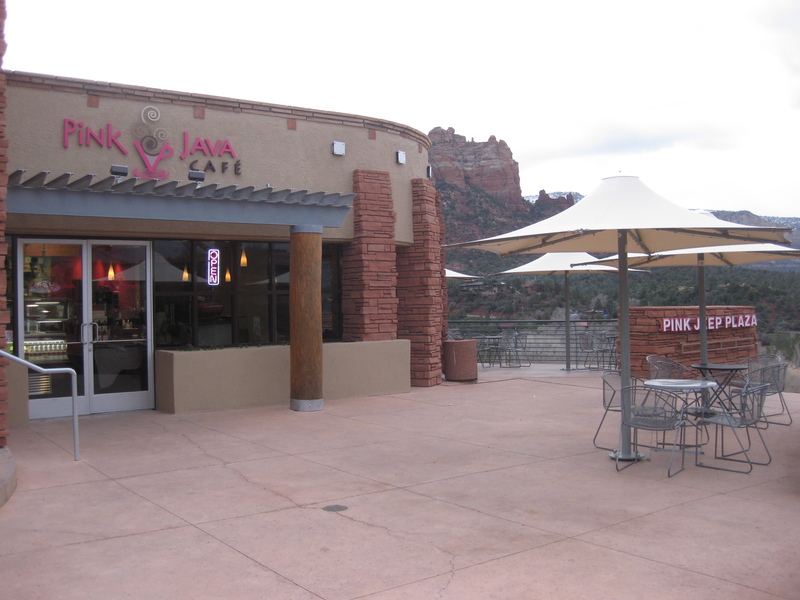 What is really a shame is to have people think that they pink Java was not able to find “good stuff” from a local coffee company. Perhaps they do think that coffee has to come from somewere else in order to be good or perhaps they think that a label validates quality. I am sure that they are using a quiality minded roasting company Larry, but my point is that coffee does not have to come from far away in order to be good. Thanks Ron, my point exactly! It’s not Ritual Coffee Roasters from SF. I called and tried to find out what coffee it was to correct this and was told it was “Ritual Grounds” from Carlsbad, CA but I can’t seem to find a company that matches that so I can’t be sure. Would love a correction to clear up the confusion. Has anyone had a chance to try their coffee? I hope so, you know, with all these opinions floating about. I was there two years ago when it was under different ownership. It is indeed the most spectacular view from any coffeehouse, ever. Wow! Great looking coffee bean grinder! Ritual Grounds Coffee Roasting is the company that Pink Java Cafe uses. You can visit their site at http://www.RitualGroundsRoasting.com and try some of their delicious fresh roasted coffee for yourself!